There are many reasons why policy manager automation implementations fail. Having been personally involved in over one hundred policy management system implementation projects and having talked to organizations both large and small that previously failed with enterprise-wide policy management software system roll-outs, I’ve heard my share of actual reasons (and excuses) that led to disappointing outcomes. “Lack of leadership” – No one wanted to manage and be responsible for the project. “Lack of governance” – The project was missing stakeholders that would manage efforts. “Lack of resources” – The staff was not available to get their policies ready, other projects became a higher priority. This likely resulted from poor or overly aggressive planning. “Lack of ownership” – While this is somewhat similar to one of the three earlier mentioned root causes, typically it is a combination of all 3. “Main project stakeholder left or moved to a different role” – No one was re-assigned or volunteered to take over project management—possibly leadership oversight was missing. “It was just too big of a project for us to handle” – This is likely due to the organization not having an early handle on the scope and efforts required to finish the project from the start. “Project died out even before it started” – No one was assigned to lead these efforts; there was not a leader or stakeholders (governance committee) to drive the initiative. “Project scope kept growing. Never got to a Go-Live” – This is likely a result of poor planning and management or lack of leadership, governance or resources. Scope creep is to be expected with a policy manager solution implementation at a large organization. Also, possibly there was not a set goal for achieving Go-Live readiness or no measurable milestones in place. “We couldn’t agree on direction” – There were too many people in charge or the project lacked the necessary governance. Often this results from allowing less significant objectives stall main project efforts. “The system was just too difficult, clunky, etc.” or “System didn’t meet our requirements” – This reason typically either means that the system was indeed too difficult to use (which although maybe the case for some software systems, possibly it was just a partial cause), often, this is a result of insufficient training from the vendor or internally within the organization. There is no best way of implementing a policy management system that applies to all organizations and all scenarios. Every situation is different. You may have hundreds or thousands of documents that are managed by a single person or dozens of departments. The policies may be already neatly organized for some sections, while other sections may be a complete mess. 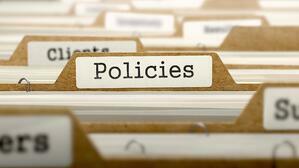 It is not uncommon to see many policies only exist in printed book formats that need to be re-scanned or retyped. Trying to overthink and plan the entire project to the very last detail is impossible and will very likely lead to scope creep and staff disengagement. It is common that with this approach the project will fail even before it gets started. Instead, come up with the main objective (i.e. all policies uploaded within 6 months), a general idea of project scope (i.e. approx. 1,500 policies), and a timeline that will allow for slippage (i.e. 12 months to get all documents online). Assign someone from your leadership team to back this project. Make sure they are involved in all decisions and they are a single point of vendor communication. Make sure this person or entity has authority to answer vendor questions. From a vendor’s perspective, there is nothing worse than a point person that is unreachable or unable to provide directions. Establish a weekly or monthly update schedule between your Project Leader and your Project Manager or Committee—objectives and progress need to be clearly managed and communicated. Note, that although it may seem the Project Manager/Committee will need to carry a heavy load, it may not be necessarily the case for every implementation. If you plan your project correctly and spread it over a longer time period, the actual weekly or daily responsibility may be quite manageable. The most important functions of the Project Manager or Committee are “ownership” and “leadership” since the bulk of the work will need to be completed by departments and or your vendor. Unless the number of documents you will need to move to the automated repository is manageable, it may not be possible to ensure that all documents are properly reviewed and cleaned prior to upload. Instead, you may want to upload all your documents “AS IS” and then use the system to remind and alert your authors and document owners about documents that need to be reviewed. The main benefit of an automated policies and procedures management system is automation of review workflow. Why not use it to your advantage when implementing the system? Unless your organization has a very good handle on all your policies already, assume that not all departments will finish review and upload of their documents at the same time. Instead, very early in the process try to establish which areas will need more time and plan them as later phases in the project. Policy and procedure review preparation is an enormous project that may span over long period of time. You need to know if your team is on target or way ahead of the project finish date. Come up with a simple project progress scoreboard and have your Project Manager/Committee communicate this to the leadership and the entire organization on an ongoing (weekly or monthly basis). React to potential slippage early and revise the timeline as needed. Don’t be shy to ask your vendor for support and training. Likely, they have done similar implementations many times and they can be very pro-active in assisting you in this project. Ask your vendor for their honest feedback on an ongoing basis. They may be able to see what is not working in your process and recognize potential points of failure much sooner than you. Remember that at the end of the day, your vendor wants the implementation to be a successful one as much as you do. Utilize your vendor’s expertise to automate manual tasks in the policy collection and review process. It is possible they have tools or scripts that can assist in automation of mundane steps that will save time and errors. Utilize vendor’s training and implementation resources to your advantage to ensure early adoption. Time is working against you, but that’s OK. You can do it! Most likely a previous attempt to get a handle on your company’s policies and procedures might have left a bitter taste. However, that doesn’t mean that the actual root reason why your organization was looking for an improved way to manage policies has miraculously disappeared. I am almost certain; the opposite is true. With every passing day the problems related to mismanaged policies are growing along with risks related to circulating outdated policies and risks of compliance violations. For organizations that provide services or products that deal with human well-beings, such as healthcare, law enforcement, hazardous materials, pharmaceuticals, etc. – incorrect policies or procedures can lead to harm or even loss of life. The stakes are high. There is no question IF you can afford to delay the project. The time to act is now. For more information about the HospitalPORTAL Intranet and Policy Manager, please contact us at sales@hospitalportal.net or review our product information here. For those of you looking for a standalone system without an Intranet, please visit us at www.ComplyALIGN.com.